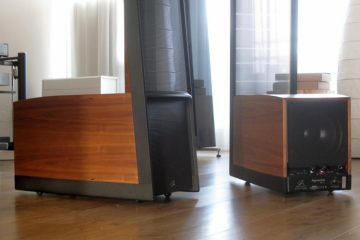 With the purchase of these refurbished Divas I have almost come to the end of my investigations for the Apogee Listening Sessions. The refurbished Duettas really are fabulous, but have some (likely crossover induced-) flaws that I hoped to address with the Divas. The latter really are magnificent but, like any speaker, also have strengths as well as weaknesses. The differences are just in very different departments than with the Duetta Signatures. Divas have been on top of my Apogee wish list from the start, but on my searches on the second hand market, for a long time I only found original pairs: dull matte grey finish and original ribbons. I didn’t really dare obtain an original set for three reasons. 1. Age: Divas were produced from 1988-1995, which makes them 18 years old at best. 2. 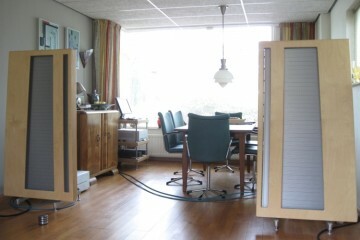 Price (original sets range from 3500-4500 euro) and refurbishing will cost at least that same amount. Reason 3 was that of all three sets of Divas that I had heard so far, none sounded as open and airy as any pair of Duetta Signatures, either originals or restored ones. One could argue that the Duettas could simply have too much treble, but I would counter that they are consistent in treble energy with other Duettas as well as Magnepan MG3.6R’s. 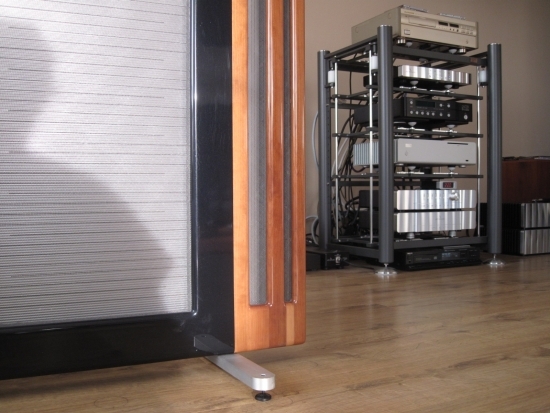 The Diva’s true ribbon tweeter is almost exactly built in the same way as the modern Magnepan true ribbon tweeter. So why would the Divas sound darker? I figured that it must be related to driver sensitivity or choices made in the crossovers. As I learned by now from experience with Duettas and Centaurs, the ribbons themselves can actually live long, happy lives. 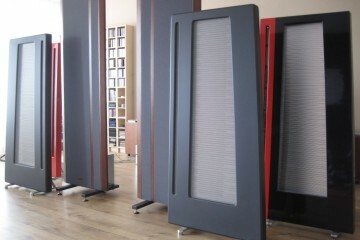 Even the bass panels. 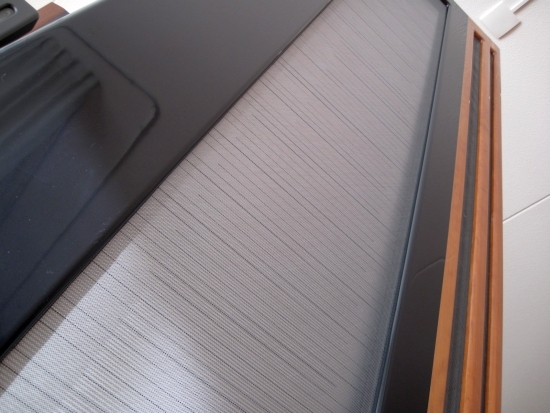 When Apogees run into problems more often than not the problem lies with the foam damping strips that are sandwiched in on either side of the membranes, together with a dose of silicone sealant. These foam strips deteriorate, much in the way that a woofer surround couples the cone to the gasket. Some speaker brands used foam instead of rubber or paper for this (Bose springs to mind) and over time this foam loses viscosity and becomes sticky and ultimately (15 years+) turns to pulp, which, if touched, literally vaporises before your eyes. 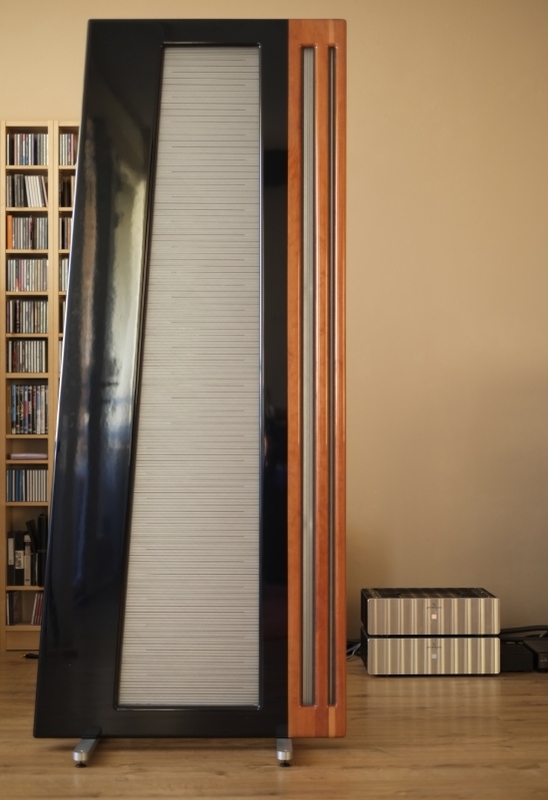 In case of dynamic woofers, the result is honky sound and possibly even screechy sounds as the voice coil scrapes against the magnet. In case of Apogee Ribbons the foam deterioration is similar, but because of the different application, in my personal experience so far the result varies from no audible problems at all, to very mild problems only audible on certain CD’s with certain types of low bass. From reading forums however I know that the effect can actually become intolerable (always audible buzz) but I have yet to encounter this myself. Above: I like to call my flock of Apogees “The Apogee Woods”. 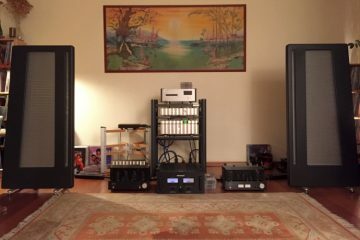 Friends have repeatedly asked me if I had planted any new trees… man, this hobby is getting out of hand..
After I reached an agreement with the Diva seller, we planned for a listening session, using moderately powered Jadis preamp and poweramp (types escape me) and a Wadia 860. 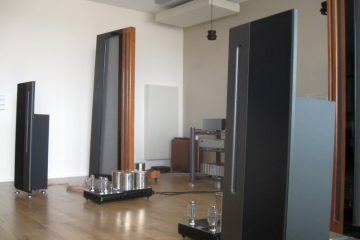 The resulting sound was pleasantly smooth and rich, but lacking power and drive. 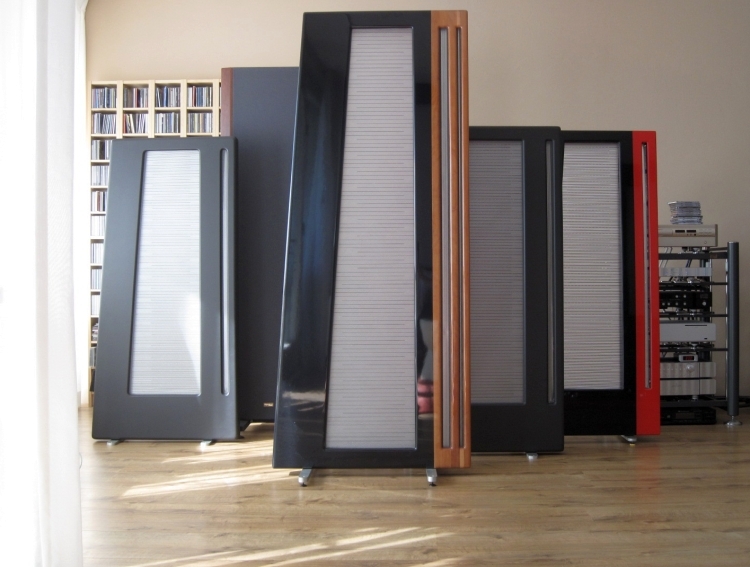 Treble was ok: quite allright off-axis but not very airy and a bit toned down in the listening spot but at that time I guessed that this was more the result of the already darkish Wadia 860 coupled to less-airy-than-rowland Jadis amps in a less than perfect set up. So, I played a few more tracks, most importantly the one with which I know that the bass ribbons will buzz if they have a problem, and decided that I wanted them. 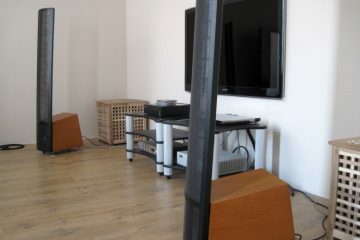 It’s possible to get these speakers up on their feet with only two people, but I really recommend three persons or more, to minimise the chance of damage. If a speaker starts tipping over, there’s absolutely no way that one person can stop it from falling. After transport first they have to be stood up straight, then titled while the footercage is moved in position under them. Then, while two people hold the speaker up and carefully move it in position, the feet are attached by means of 4 screws. Don’t think of inserting the spikes without using protective cups under them – with the weight they’re carrying, the spikes will pierce any wood or laminate floor, and your thumbs or toes along with it! First position was roughly in the same place as the Duetta Signatures but there was poor focus and little layering to speak of. After moving left, right, back and forth all night, the best position turned out to be with the tweeter in almost the same position as the Duetta Signature’s MRTW ribbon. The Diva’s midrange ribbons will thus be further apart from each other. Placing the Diva’s midrange ribbon into the old Duetta Signature MRTW’s position made for a narrow soundstage with a forward midrange and lack of spaciousness. 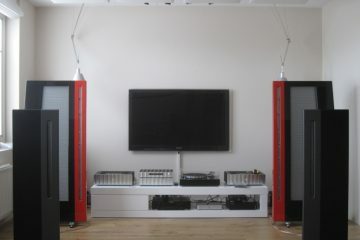 Even after the “optimal” position was found, I kept moving the speakers in all directions for hours but couldn’t find a spot where they had focus and soundstage layering as good as either original or refurbished set of Duetta Signatures. There is some focus (not an entire lack thereof), but it is not razor-sharp and seems to lack coherence, and this reminded me of what I heard with the Full Ranges at Niels’s setup. 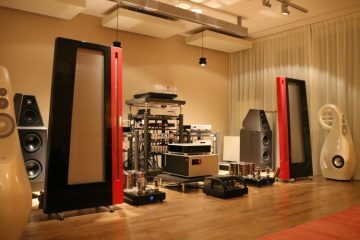 That, I so figured, wasn’t merely a matter of acoustics, listening distance and room size, but also perhaps of speaker complexity. A possible explanation for this could be that having separate ribbons for midrange and treble and the necessary extra crossover components would make for more complexity and a less focused sound. I would later learn that while this might be a factor, there was another much larger contributing factor. In addition to the less than Duetta-like-soundstaging, there was something else that bothered me. You probably guessed it: treble. It’s not that the Divas are dark per se, and although the literature states that they are actually ruler-flat up into inaudibility, but I would still say that the most upper treble (over 8kHz) sounds toned down in output. The midrange officially crossover over at 11-13kHz the problem area seems to be the treble ribbon, not the midrange. Many people talk about treble, an amp or a speaker sounding rolled off, while I don’t experience this with those products at all. When speaking of components that I have personal experience with, they will consistently sound friendly throughout the higher midrange and lower treble, and extending into airy treble, so I suspect that these people are actually talking about high-mid or lower treble. After applying the tweak that I will reveal later, the Divas really do have plenty energy in the midrange all the way up to ~10kHz. Because my Magnepan MG3.6R’s have very similarly built treble ribbons and contrary to the Divas have superbly open treble with lots of air, I figure that the root of the problem must be in the crossovers, but for these Divas, those have been rebuilt. I checked with Henk and he confirmed that he had 1 for 1 copied the measured values of the original crossovers. So, apparently, whatever treble energy reduction was present in the original crossovers, carried over into the new ones. It wasn’t until the third day that I noticed how the treble was nicely open and airy on axis (right in front of the speaker) and dulled in the sweet spot. It reminded me of comb-filter effects and then of out-of-phase problems. What if the treble wasn’t in phase with the midrange? I decided to inspect the crossovers and see if something can be done. The treble dullness above ~10kHz that I hear in all Divas is surely not a defect, or a defect in my hearing for that matter. 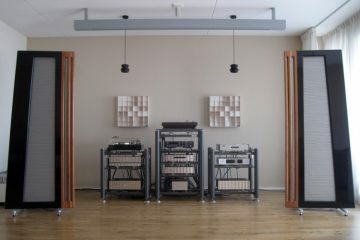 At this moment I have 3 sets of Duetta Signatures in the room, along with the Magnepan MG3.6R’s and in the other room I have B&W Nautilus 804’s and 805’s. Compared to either Duetta pair or the Magnepans, or even the N804’s, the Divas sound audibly rolled off from ~10kHz. That is, without tweaking. But it’s not the first time I hear a speaker sound this way. The big and costly B&W 800D’s had a similar treble response (not the comb filtering effect though). As were the Avalon Eclipses and I recall a few other instances in which I felt this way. So, it’s not my ears, or the room, rather, it must be a design choice. But likely not something most reviewers would normally comment negatively about. However I did read somewhere that a respected reviewer commented that the Divas don’t have exaggerated treble, but that they’re just pure and natural, as treble should be. Of course it’s all relative, about design choices and personal taste plays a large role as well. So, are Divas dark-sounding? This depends on your personal experience and taste. They don’t really lack treble – it’s all there, to these ears it’s just toned down a bit from ~10kHz and lacking some air. Think of it what you will, but I don’t feel like that with the Duettas or Centaurs, or with the Magnepans for that matter. But as you can read below, I found a way to minimise the effect by means of substituting a different value for the treble resistors, resulting in treble on par with Dueatta Signatures, if still not on par with Magnepan MG3.6R’s. The crossovers that came with this set of Divas were not original – they had been rebuilt using better components. All the adjustment switches had been removed in the process initially leaving me with the question: what fixed position were they now in? 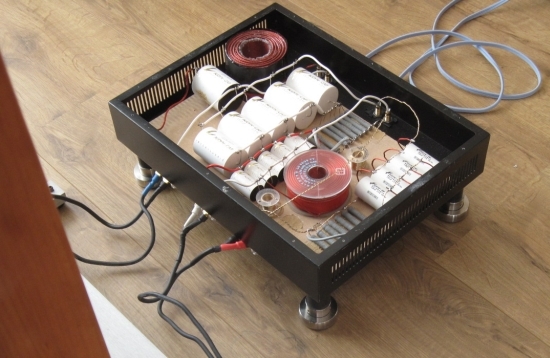 Judging from the lack of real treble energy I figured that treble had to be in the lowest position and from looking inside the crossover box, this did indeed seem to be the case as there were a plethora of resistors in a combination of series and parallel connection in the circuit leading to the tweeter. It must be said that in retrospect at this stage I did not try hard enough to entirely understand the crossover (I am not a speaker designer and do not fully understand the way that changing resistors not only changes level but also crossover point and/or phase behaviour) and now that I am rewriting this review and I have had help in calculating the exact values, I know that what follows was still not optimal. But for now let’s continue with the story in a linear fashion. 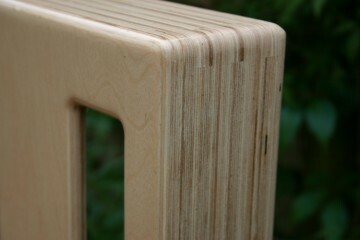 So, I bypassed the resistors and you guessed it: now they had excellent treble, airy and refined yet very articulate. Naturally having no resistor in the path at all made them sound too loud but that would be a matter of experimenting with different values. In spite of higher output however still there was this strange phenomenon that the treble was only good off axis but absolutely dulled in the sweet spot. 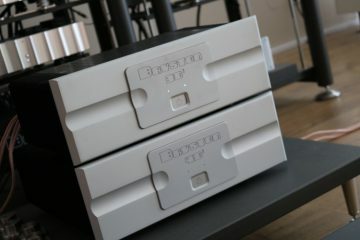 In an effort to rule out problems with the Diva’s new crossovers, the first thing I tried was to connect the Duetta Sigs’ external crossover to the Diva, effectively making the Diva a 2-way speaker, leaving the treble disconnected. But since the Diva’s midrange seems to be a longer version of the Duetta’s MRTW, I figured there would be no harm done. Actually: the sound improved a lot! 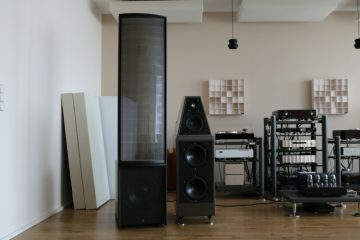 The soundstage was more coherent, wider and deeper and overall more 3D and treble was also more open, in spite of lacking a pure ribbon tweeter this time. Also: there were no weird phasey problems anymore: treble energy was stable no matter where I listened, also in the sweet spot. Now I knew for certain that there had to be something with the new Diva crossovers. I started to suspect that the treble foils were connected with incorrect phase. Empowered by the positive outcome of using the Duetta Sigs’ crossovers, upon reconnecting the Diva’s crossovers, I decided to just connect the tweeters the other way around. Guess what? Treble was now nicely open and airy! But the best thing was that I now heard excellent treble both on axis as well as in the sweet spot, and what’s more: soundstage focus and layering had now also greatly improved. At a later stage I had contact with Henk again about the crossovers he built and he reassured me that not only the values were all the same, copied 1 on 1 from the values he measured from the original components, but also that he was sure that he hadn’t inverted phase for any of the drivers. Importantly, Henk indicated that he wound-off coils to get to the desired value, so the printed value is not a good indication. So in addition to misinterpreting the treble resistor value, that was another mistake I made. Knowing that Henk is indeed very precise in the way he works, and also knowing that all other Divas I heard, either passive or full-blown active, also sound this way, I can only conclude that these must have been conscious design choices. 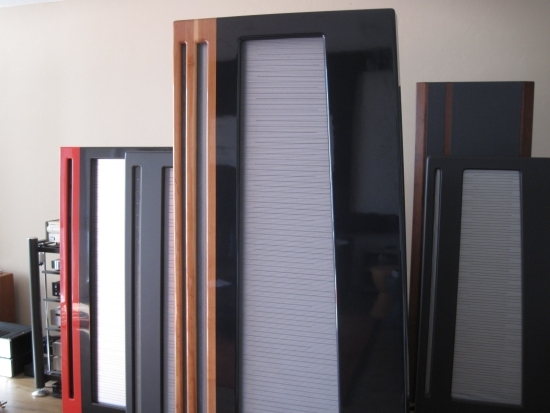 What followed was lots of trial and error, using various values of high end Mundorf Supreme resistors. Over the coarse of several months I closed in toward a more balanced sound. Now that treble and midrange were closer in openness to the Duettas, the only remaining item for me was that the Duetta Sigs sound fuller and richer in the bass. This is very much a feature of the Duetta itself, but one substantiated by the components used in their rebuilt crossovers in case of the Refurbished set. The latter even cause a severe room-mode excitement which all other Apogees (original Duetta Sigs included) don’t do. For the bass, the previous owner uses a Jansen Wax Copper Foil Coil whereas the rebuilt Diva crossover uses an Intertechnik Tritherm braided litze Coil. The techniques couldn’t be any more different. Of course this is a matter of taste and one might well have a preference for one over the other. Without the knowledge that I would later have, my guess at the time was that the Inter Technik coils used in my Diva crossover are more accurate but also causing the bass to be less voluptuous than it can be using the Jansen foil coils. Also, I suspect that the imaging can be improved (or at least, changed in character) by this coil, as well as by carefully replacing some caps with other brands. This is admittedly all going a little bit over the edge, and I’m quite happy with how they sound now, so that might be an experiment for another time. The good thing is that, due to the crossover being external, such changes can always easily be reverted if need be.